Join me on Thursday, November 30 from 6:00pm – 8:30pm for a special art show and sale at the STUDIO. There will be original Intuitive Paintings by myself, along with mixed media works by artist Georgann Gosselin. On Thursday, November 30th, it also happens to be my 30th birthday. 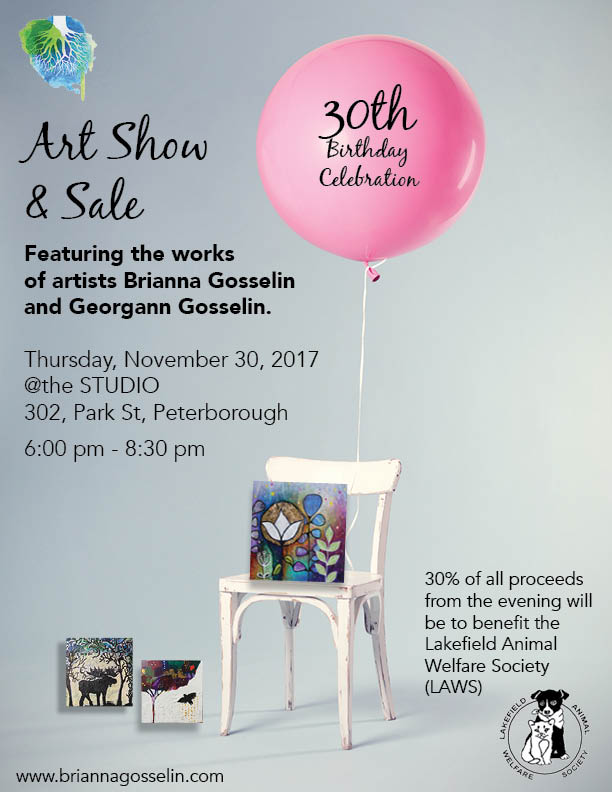 To celebrate, I wanted to host an art show and sale with 30% of proceeds from the evening going to LAWS (also known as Lakefield Animal Welfare Society). This not-for-profit is an organization I care for greatly, the amount of work and help they provide for animals is amazing. There will also be a donation bin for canned dog/cat food, dry food and anything else you would like to donate to LAWS. I have also teamed up with artist David Hickey and commissioned him to create 30 metal bird sillhouettes. Taking 30 canvases measuring 6″ x 6″, Ill paint them in the style of my Intuitive Painting and incorporate David’s work with my own. David Hickey has been an artist I have admired for quite some time and am honoured to be working on this project. Another collaboration I am excited to share with you is between myself and woodworking artist Chad Miller (Country Moon Woodcrafts). We are currently working on some unique wooden scultpures for you. More details and sneak peaks are on the way! Its sure to be a fantastic evening and I cannot wait to share my world with you all! ?